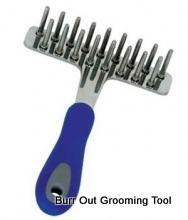 Burr Out effectively detangles manes and tails every time and helps prevent damage to your hands in the process. Featuring 17 tapered teeth that are slightly offset in two rows, An extra wide 4-3/4" design allows you to cover more area quicker and more effectively than with a conventional mane and tail comb. Constructed with a stainless steel main body and teeth, the Burr Out will not rust or break under pressure. Burr Out has a comforable, ergonomic handle and is perfect to use with your favorite detangling and shining product. This versatile tool also makes a great mane and tail comb.